Attracting and keeping frogs and toads in your garden will help reduce pest populations naturally without the need for pesticides. 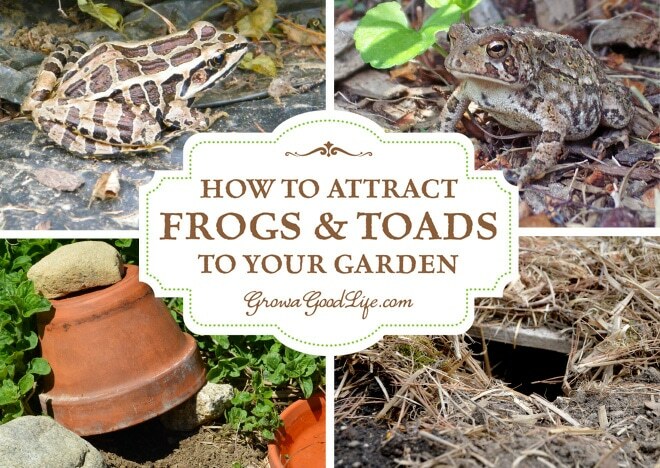 Here are some tips on how to attract and encourage frogs and toads to live in your garden. Earlier this spring, I spotted a hole in the soil in one of my raised beds while walking the garden. When I returned a few days later, I saw that the hole was larger. Last year, I had a huge problem with voles in the garden that reduced my yield of potatoes and carrots. “Not this year!” I thought as I inspected the hole with my gloved hand. I pulled away some of the soil from the edge of the hole and spotted something grey inside. I grabbed my garden trowel and dug down beneath the grey thing and carefully lifted it up. The grey blob was covered with dirt, but moved every so slightly. I almost screamed, but I was determined to figure out what it was. I dropped the shovel full of soil and grabbed the grey thing with my gloved hands. It took a few seconds for me to identify it. As the soil dropped away, I saw that it was a rather large toad! It wasn’t moving much, and its eyes were closed tight. I looked it over carefully and was so glad I didn’t hurt it with my garden trowel. I carved out a shallow hole and placed the toad back into the ground while I searched the yard for a rock or piece of wood to use as a roof for the temporary toad home. When I returned and peered into the hole, I was astounded to see that the toad was gone! I found it again when I poked into the loose soil. It buried itself that quickly and blended with the soil. 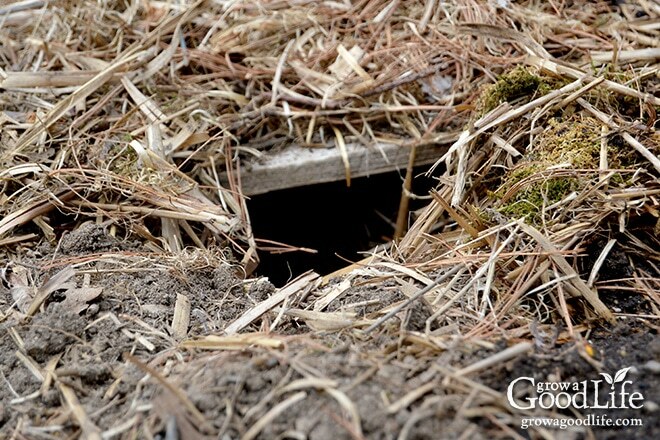 I placed the roof over the hole to leaving a small opening and covered it with last year’s straw. I checked on the toad a day later and spotted it at the entrance of the opening warming itself in the spring sunshine. After shaking the winter hibernation sleepiness, the toad will return to its birthplace to spawn. This toad will probably hop to the edge of the yard and down the bank to a small stream that winds through the woods. I hope it makes it back to the garden for the summer. Frogs and toads are both amphibians and belong to the Anura order. Although they are similar, frogs and toads are easily distinguished by certain traits. Toads have dry, bumpy skin and spend most of their lives on land. In winter, toads hibernate on land beneath the frost line. They burrow down in the soil using their back legs. Frogs have moist smooth skin and spend most of their lives in or near water. 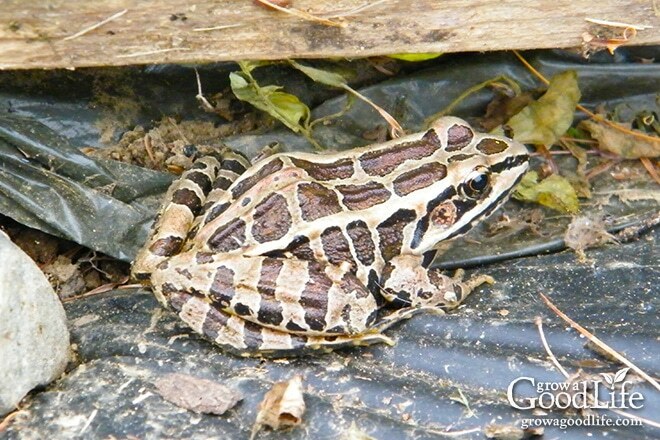 When I started gardening, my first amphibian friend was a pickerel frog. I was surprised to learn that frogs don’t spend all of their time in water, but will venture out to grassy areas in search of food. This one stayed in the garden all summer hiding away under boards and in between the foliage in the herb garden. It would startle me once in a while by jumping out of the foliage when I disturbed its hiding place. In the winter, Pickerel frogs hibernate in the mud debris and silt of ponds or streams. Both frogs and toads are beneficial to the garden because they feed on many pests such as, bugs, beetles, caterpillars, cutworms, grasshoppers, grubs, slugs, and a variety of other pests. A single frog can eat over 100 insects in one night. Attracting and keeping frogs and toads in your garden will help moderate pest populations without the need for chemical or natural pesticides. Eliminate Chemicals: Pesticides, synthetic fertilizers, and herbicides can poison frogs and toads. Frogs and toads breathe and drink through their skin. Eliminate chemicals and garden organically. 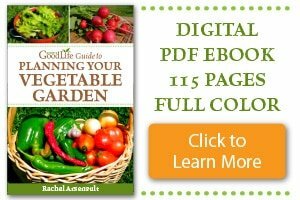 Build healthy soil, companion plant, and use crop rotation and organic gardening techniques. Encouraging frogs or toads to stay in your garden will take care of any insects naturally. 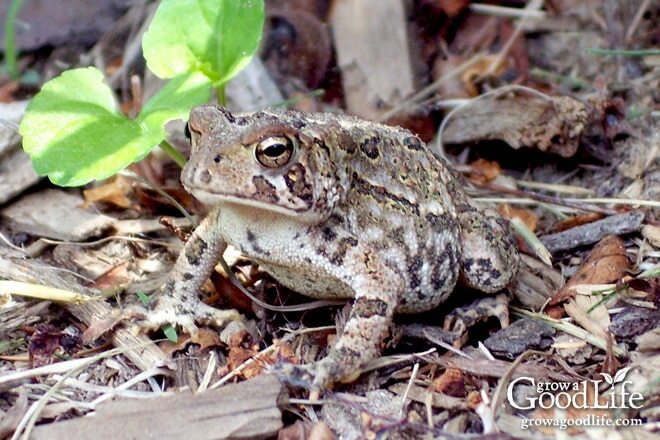 Offer Shelter: Most toads and frogs are nocturnal and avoid sun to prevent dehydration. They prefer damp, shady areas and need shelter to hide from predators and escape the heat from the daytime sun. Create a shelter by arranging stones into a small cave. You can also use a clay or ceramic flowerpot as housing. Turn the pot upside down and prop it up with rocks leaving enough room for the frog or toad to slip inside. Locate your shelter in a quiet area that has a lot of shade. Provide Water: Toads and frogs don’t drink through their mouth. Instead, they absorb moisture into their bodies by sitting in water. 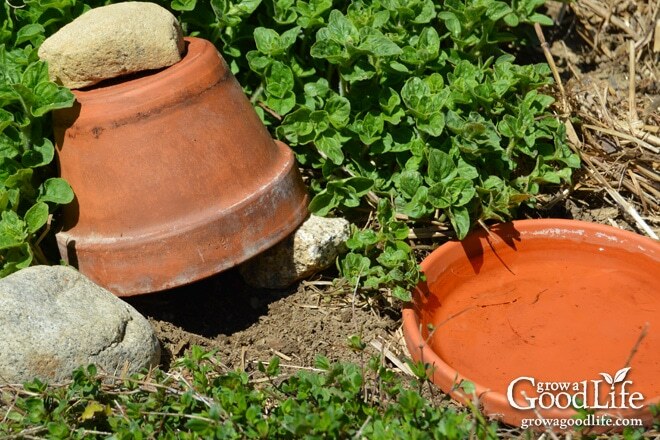 Place several shallow containers of water in the shade near the shelter. Rinse the containers out at least once week and fill with fresh water. Tanya at Lovely Greens built a small wildlife pond to attract frogs to her garden. 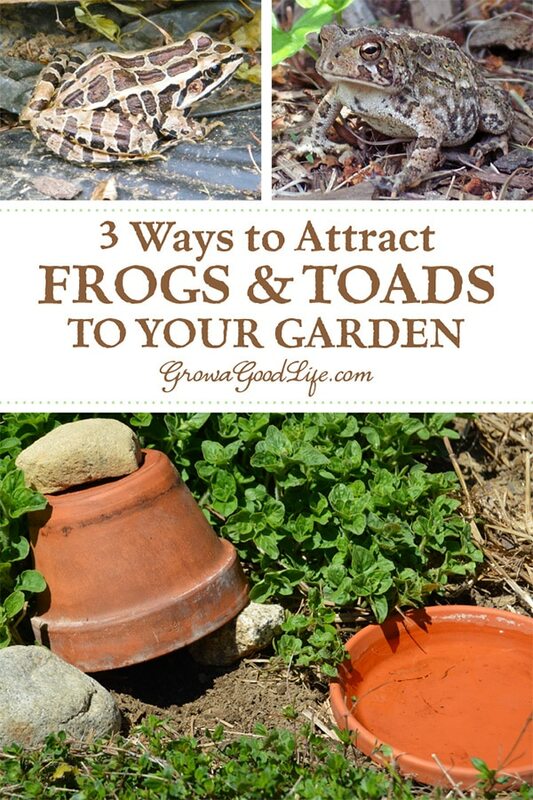 Attracting and encouraging toads and frogs to live in your garden keeps the pest population down and reduces the need for pesticides or other natural insect deterrents. Just one frog or toad can eat up to 10,000 pests during the garden season. Toads and frogs will often return to the same location from year to year as long as the environment is pleasant and there is plenty to eat. Bradford, Alina. “Facts About Frogs & Toads.” LiveScience. TechMedia Network, May 1, 2015. Web. May 7, 2016. Smolowe, Laura. “Who Is the Pickerel Frog?” Herpetology Species. Yale University, 2000. Web. May 7, 2016. “Toads – National Wildlife Federation.” Toads – National Wildlife Federation. Web. May 7, 2016. Caution: You may not want to encourage frogs and toads to stay if you have dogs that enjoy hunting down toads. As a defense mechanism against predators, most toads release skin secretions which produce a foul-smelling odor and can be toxic to dogs and other animals. I have a purpleish frog (I believe is a toad) that loves to hang out inside my garage & I put down in a corner a flower pot bottom with a few rocks in it! I guess he figured out that there are lots of bugs in the garage, he goes outside every now and then, but comes right back in! He also doesn’t seem to mind my dog or cat, lol I am a frog fan & this article is great! Thanks for sharing! I have a bird bath top that once the pedestal broke I set it on the ground and filled it with a few rocks and water just for fun in my flower garden and was pleasantly surprised when I found a toad soaking in it. I have a couple toads now that live in or around the garden and they love using the “pond” I created by accident. The toads have startled me a few times, but I love having them as part of my garden because I know they are helping with the bugs. Thought I’d post as a suggestion for any old birdbath tops anyone finds. The birds still enjoy it as well! Robert, I love this! What a great way to repurpose a broken birdbath. Thanks for sharing. I know this is an older post now, but I’m curious – did you come up with a solution for the voles? 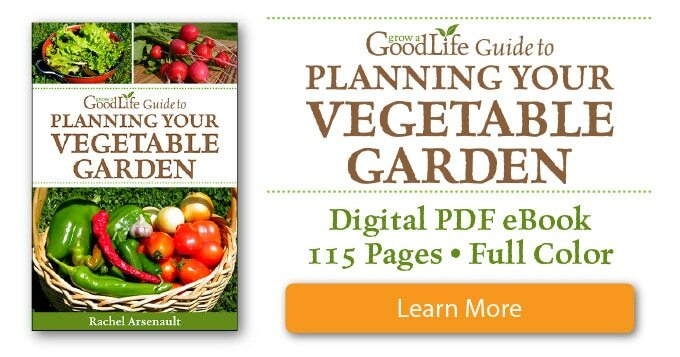 They decimated our root crops last year and I don’t want that to happen again this year…. I also would rather not kill them, and I don’t want to use anything toxic to the environment. Rebecca, Unfortunately no, I have been unable to get rid of voles in the garden. I no longer plant root crops in the area where they seem to be more of them. The neighborhood cats keep them in check. However, it is rarely a season where I don’t loose some crops to voles. I wish I had a solution. I recently noticed a big golden toad sitting inside my spare pot.i would be glad if you could inform me about the golden toad . I had many times in the past to scare away toads but they seem to like thst particular shaded spot. Sheetal, It sounds like your golden toad feels safe in your spare pot. :) Toads are really helpful to have around. Try searching google for “golden toad” to see if you can find a photo that looks like yours. Great post! I discovered a toad this Spring in the garden (and did scream) and was so happy at that sign of bio-diversity. We are all-organic and have tons of plantings for beneficial insects. That is awesome, JessB! I hope your toad sticks around and eats a lot of garden pests. Great article! We have to have our home exterminated due to carpenter ants, and I fear it will affect any toads/frogs we have around the house. Any suggestions? Sometimes we have to make hard decisions. Preventing carpenter ants from destroying your home is a priority. Talk with your exterminator about your concerns for wildlife around your home. I wouldn’t take any measures to attract frogs and toads near the house for a while. We don’t have a natural water source around but still see the occasional frog hopping around. One of my long term goals is to set up a small pond & hopefully, we’ll see more once that happens. A pond would be a nice addition to the garden. I am thinking about it too. Good tutorial. We had a Pixie troop make some toad houses for the community garden by cutting a hole in the rim of an inverted clay pot and then decorating it with glued-on bling. Never found a toad using them, but they were fun to do. Other great thing to have in the garden is the garter snake, they love those slugs. Yes, garter snakes are great garden companions too. I have one that lives in the rock border of my herb garden.